It is cold in Ottawa during the winter time. We aren’t so adventurous as our friends Friedel and Andrew who cycle and camp out on snow days. Instead, we trade in our bikes for cross-country skis. 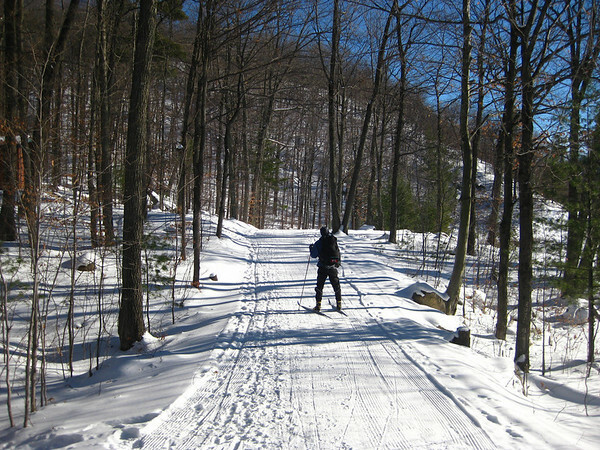 We often head to Gatineau Park, since it’s nearby, and has hundreds of kilometres of ski trails. 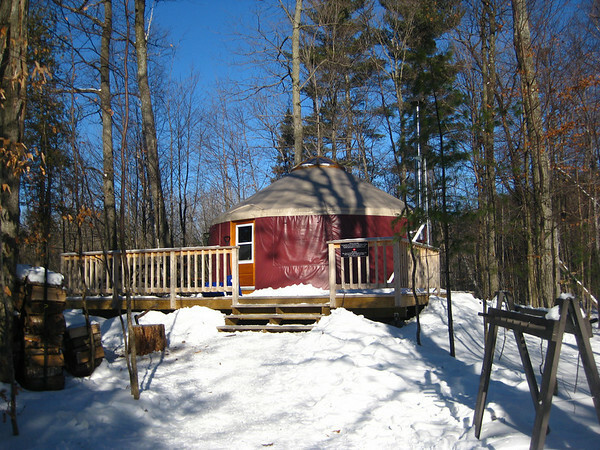 This year we decided to try out yurt camping – Becky booked us an overnight in the Taylor Lake Yurt up in Gatineau Park. Getting there required a 6 km ski involving a few rolling hills. Not much distance, but we were carrying extra food, clothing and overnight gear, which added to the challenge. 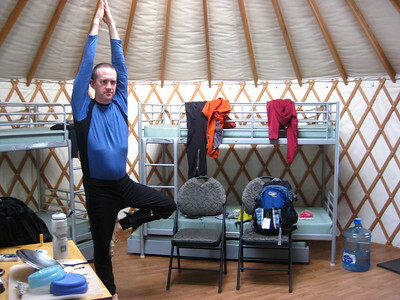 Having never stayed in a yurt, we didn’t really know what to expect. When we arrived, what we discovered was luxury camping, although perhaps we shouldn’t really call it camping. Our yurt had a wood stove for heating – with a nice glass window so we could see how the coals were burning in the middle of the night, a propane stovetop for cooking, pots and pans, bunk beds, a fridge, and a picnic table. 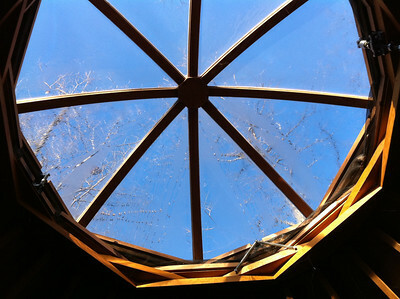 To top it off, there was a sky light in the centre of the ceiling, so we could see the stars at night and the trees above us during the day. We enjoyed the ski up to the yurt, and upon arrival, quickly dropped off our heavy gear and went out for a bit more of a ski in the remaining few minutes of daylight. By the time we got back to the yurt, we were happy to have our headlamps! It took us much longer than we had hoped to get the fire going. At first, it just wouldn’t seem to stay lit. We were shivering and wondering what we were doing wrong. Fortunately, they had some directions on the wood storage box which explained that we should be using pencil sized kindling. Our previous kindling was too big and we didn’t have enough of it. Scott went back outside to chop some smaller kindling, and with smaller kindling in hand, it only took Becky one additional match to get the firing going. Clearly our Scout/Guide skills are a bit rusty! While the yurt was warming up, our stomachs started growling so we enjoyed some baguette and brie while our dinner was cooking. It took about 90 minutes for the yurt to get warm – longer than Becky expected. 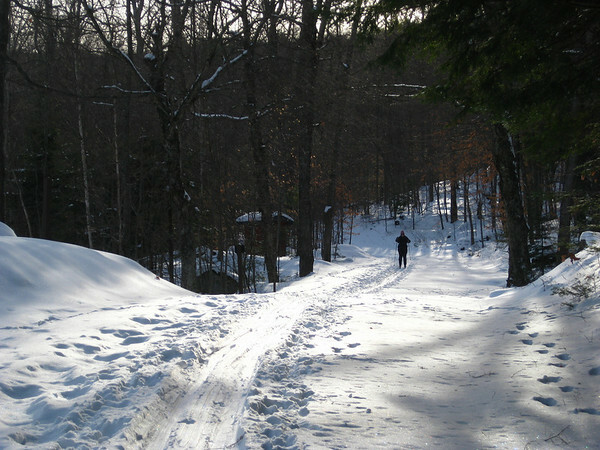 We often go for a ski up to the cabins in Gatineau park, but there always seems to have been someone there before us to start the fire and warm the cabin – we have never entered a cold cabin! Unfortunately, the struggle with the fire meant that Becky spent much of the night nervous about the fire going out. She was glad for the glass on the wood stove that allowed her to see how the fire was burning each time she awoke in the night. She got up several times to throw a log on the fire, ensuring that it didn’t go out in the night. The beds were quite comfortable, and Scott slept solidly all night. In the morning, we took advantage of the sunny skies, and went for a short ski without our overnight gear. Unfortunately, Becky seem to be having some issues. She fell early on, then again whilst descending a hill. Eventually, she gave Scott her light backpack. She was not feeling quite right, so we headed back to the yurt. Once inside, Becky took off her ski boots to discover she had a US Quarter under her insole. No wonder her balance was off! It must have fallen from the shelf in the front hall and rested nicely under her heel for the ski up – once it got dislodged it moved to below her toes. Then it totally threw off her balance – at least that is the excuse she is using! We stayed in the yurt right up to the last minute. A half hour before checkout time, the safety patrol arrived by snowmobile to ensure everyone was OK. It was quite funny to watch as the driver took off his helmet and exchanged it for a Santa hat. He came in to check that we were OK, then proceeded on his rounds. We suspect they do a survey of all cabins and yurts before the cleaning crew arrive. If we were unable to get out on our own, the patrol could have given us a ride on their snowmobile (or the sled they were towing). It was a spectacular day for a ski home – sunny, blue skies and fast snow. A wonderful early Christmas present!